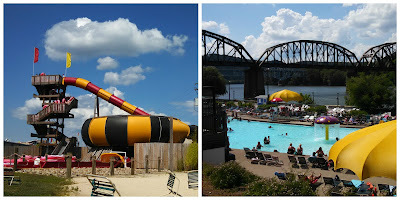 Pgh Momtourage: Sandcastle Waterpark: Save $10 per ticket! We've arrived back at that special season where summer is right around the corner! My guess is that most of us are ready to take some deep breaths of relaxation, enjoy the beautiful sunshine and plan some summer fun. My kids are in their final weeks of school and our summer bucket list is being finalized! Sandcastle is always near the top of the list and one of our local Pittsburgh gems. Whether you're planning a stay-cation, traveling through from out of town or simply looking for ways to cool off during the summer heat, Sandcastle is one of our favorite water destinations in the city. The location is amazing as it has been transformed from an old railroad yard, directly overlooking the Monongahela River. It's hard to believe you're in the middle of the city! Wet Willies is always one of our first stops in the park. My kids love controlling 20,000 gallons of splashing fun, pulling ropes, twisting valves, and turning handles that unleash geysers, fountains and sprays! Sandcastle opens Saturday, May 27- Monday, May 29 for Memorial Day Weekend. Hours are 11am - 5pm. Sandcastle is closed Tuesday, May 30- Friday, June 2, but open on Saturday, June 3 -Sunday, June 4. Beginning Saturday, June 10th, they will be open daily for the summer hours! There are two specific kid areas geared towards our littlest ones with shallow pools and zero depth entry, including Wet Willie's Waterworks and the Tad Pool. 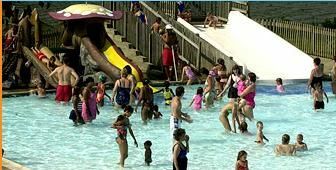 There are at least 4 areas with zero depth entry and life jackets are included for the wave pool. Oh, how my kids love the wave pool! Tickets are only $22.99 when you purchase this special offer online! Children 3 and under are FREE. Junior (48" and under) and seniors (age 55+) are $22.99 at the gate (plus tax). For adult tickets, this is a savings of $10 per ticket for weekdays and $12 per ticket for weekend! (Tax and processing fee are additional). This is an online offer only! Not valid at the gate. Purchase here for this special rate. 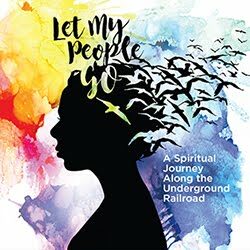 Or use promo code PGHMomtourageSBlog17.